Master Mind is one of those iconic games from the 70s that I think everyone from my generation’s parents owned. I know mine did. But how many people have actually played it? Or knew that there were several variants released? Including the deluxe Master Mind that we picked up at a car boot sale a while back. But, before we move on to deluxe Master Mind, let’s start with the original game. Firstly, it’s worth pointing out the Master Mind the game has absolutely nothing at all to do with the television programme. Nothing at all. 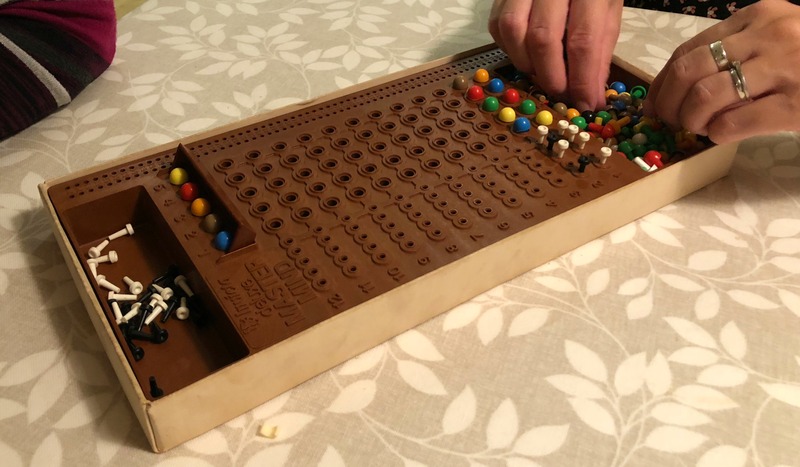 Master Mind is a code breaking game for two players that was originally developed in 1970 by an Israeli postmaster and telecommunications expert. 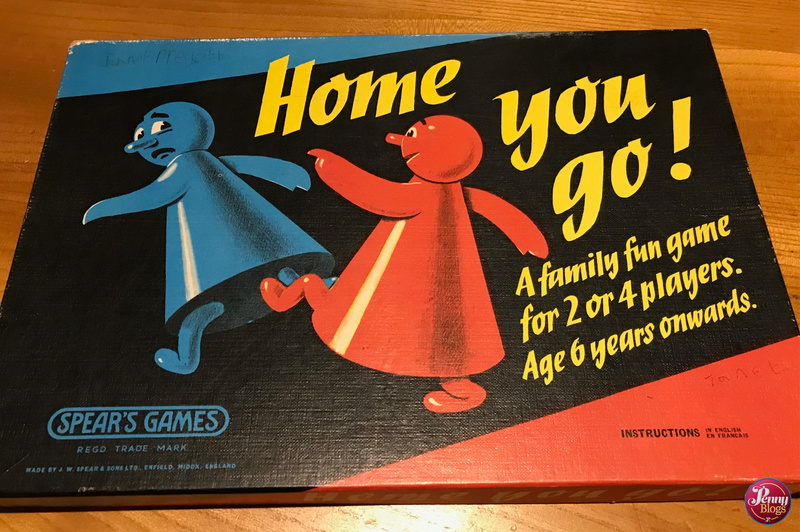 He showed the game at the Nuremberg International Toy Fair and it was eventually picked up by a UK plastics company (Invicta) who went on to develop and manufacture it. The game itself had a bit of an air of mystery about it. The box cover featured a seated business man and a woman of Chinese appearance stood behind him. The game itself is nowhere in sight. How peculiar. 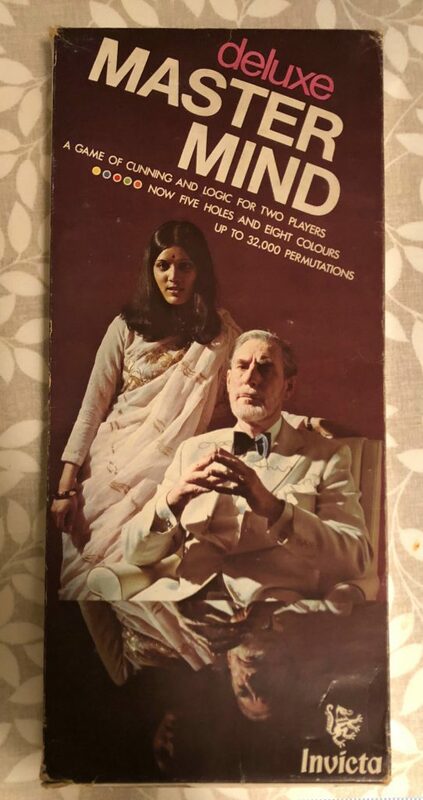 Strangely the pair of them became quite an iconic couple with the man in question reaching some level of fame as Mr Mastermind. My searches online for more about the history of the game came across a fabulous article about the pair of them being reunited years later and talking about how they had no idea quite how iconic they would become. 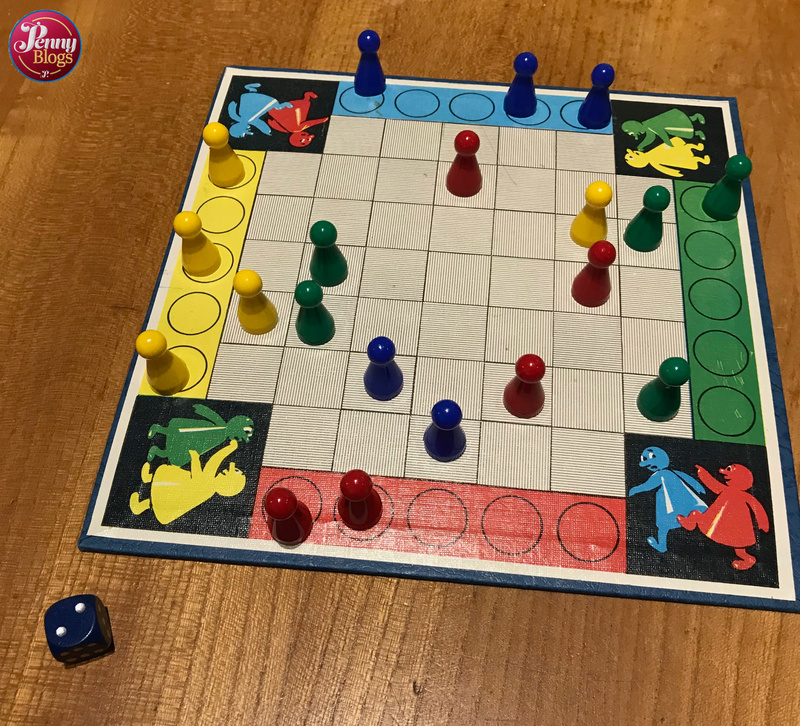 Described as being a game of cunning and logic, Master Mind is all about one player setting a code (made up from four coloured pegs) and their opposition trying to work out what it is. Each time they make an attempt to guess, the code maker scores their efforts to give them hints about what they should try next. 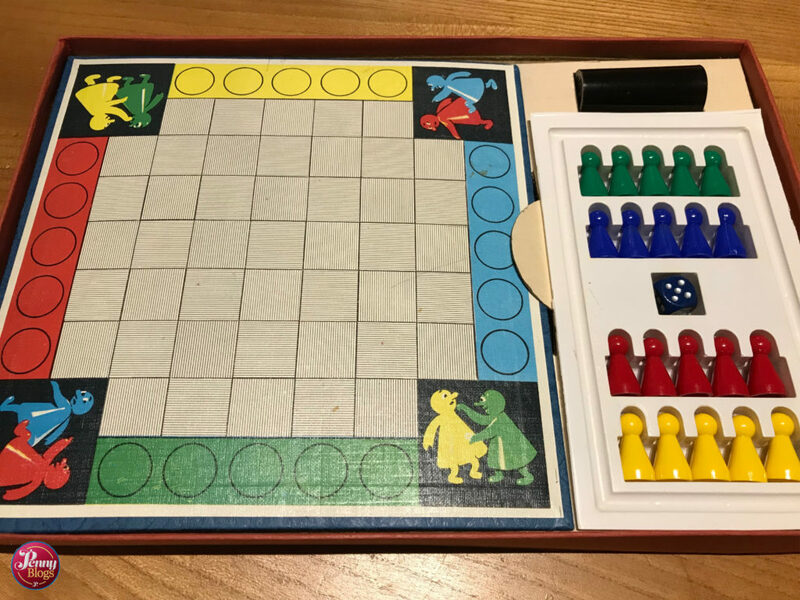 The game centres around a complicated looking plastic board and lots of coloured plastic pegs – hence the reason I’m guessing a plastics company got involved originally. 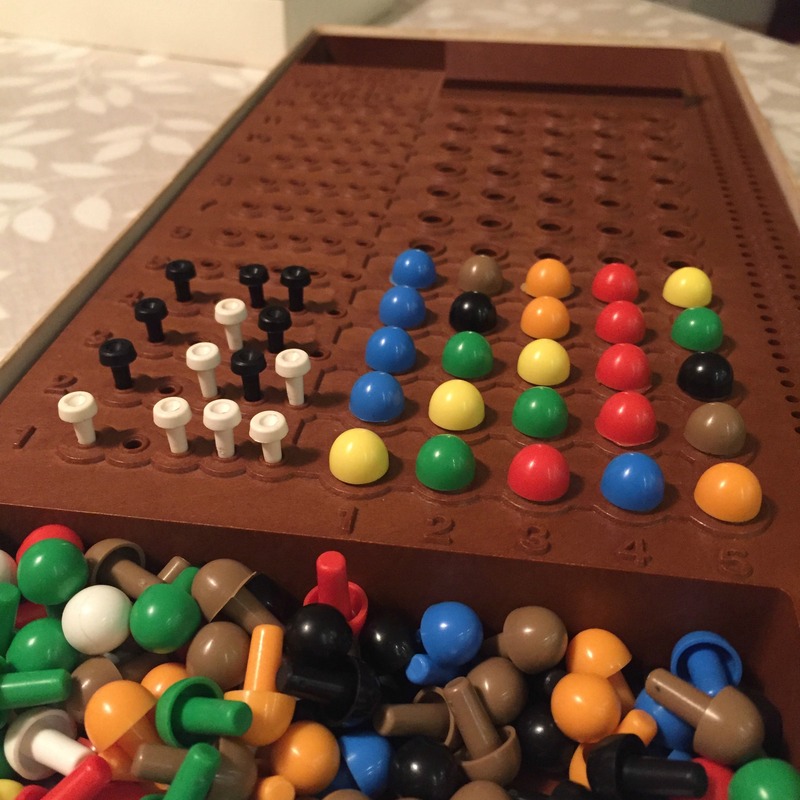 The original game features a code of four pegs which are selected from six different colours. This means that there are a total of 1296 different codes that can be generated by the code maker (assuming they can use duplicate colours in their code). The code breaker has up to 12 attempts to break the code and each time they are told (using other coloured pegs) whether they have any pegs of the right colour in the correct position, or just how many pegs they have placed are the right colour but in the wrong position. I hope you’re following this. There will be a test at the end! As if this doesn’t sound complicated enough – let’s now move on to deluxe Master Mind which is what we picked up at the car boot sale. 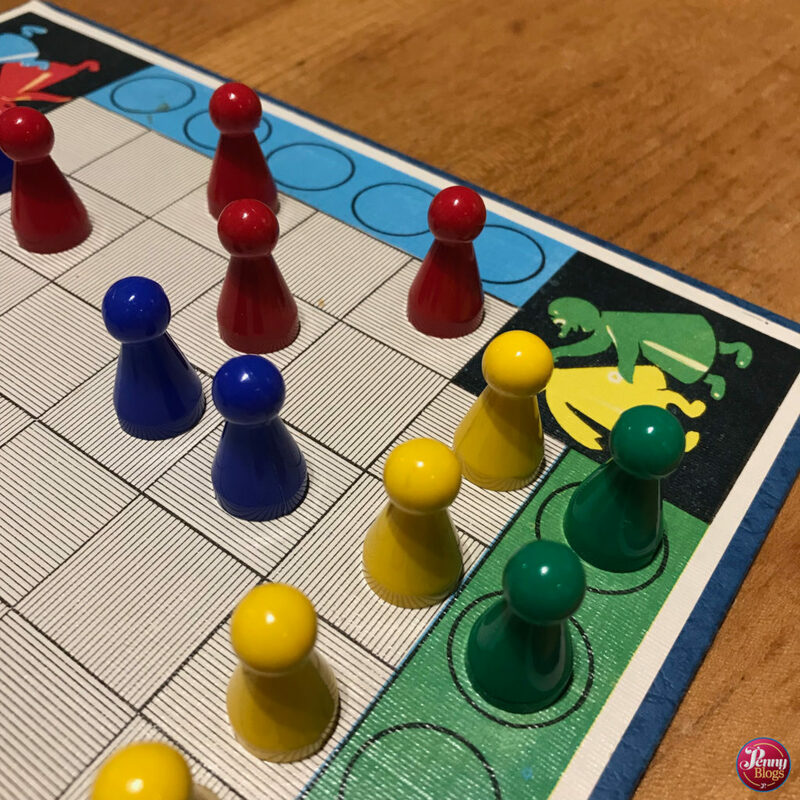 Following on from the success of original Master Mind, deluxe Master Mind extends the game so that there are now five holes and eight colours. This means up to 32,000 permutations. Yikes. One of the most obvious things when you look at the deluxe Master Mind box is that a different couple appear on the cover. Again you have the seated white business man, but this time behind him is a woman of Indian appearance. It’s still an iconic look, but a different couple. This extended version of the game also appears to have gone by the name Super Master Mind too. The games inside are identical from what I can tell, but the name different. Possibly for different markets. 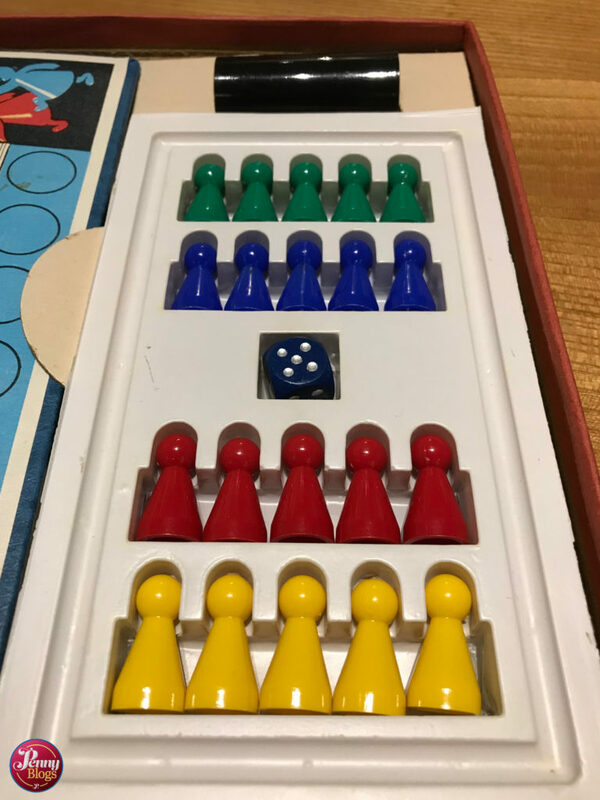 Inside the box you’re again faced with a familiar looking plastic game board and an array of coloured pegs of two different sizes. The bigger pegs are used for setting and guessing the code, whilst the smaller black and white pegs are for the code maker to score their opponents code breaking efforts. Also included are some additional smaller pegs for scoring on the same board. Now, the hard bit for us was working out how to play. Everything we found online told us that the instructions were normally printed on the base of the box. They’re not in the edition of deluxe Master Mind that we have, and nor was there an instruction leaflet inside. Luckily we think we managed to piece most of it together from things we found online. 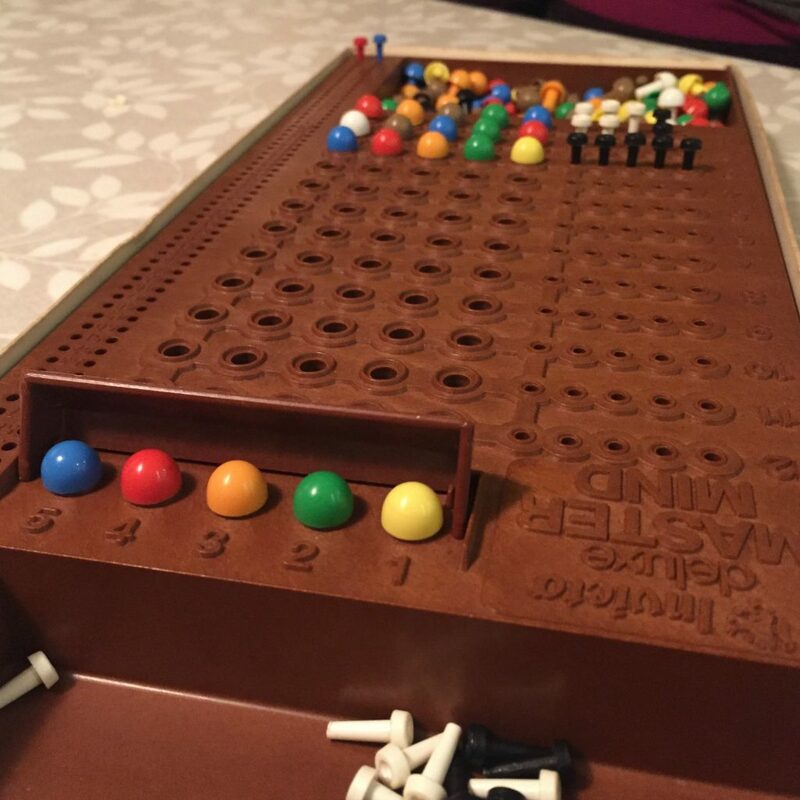 The easy bit is the code maker setting a code and arranging their five pegs behind the included little plastic screen so that their opponent can’t see them. The code breaker then makes a first guess as to what the code could be by arranging pegs in row one of the board. The code maker scores them with a black peg to denote that a colour is in the right position and a white peg to show that a colour is right, but in the wrong position. Now, the bit we weren’t totally clear on is if you tell the code breaker which peg is the right colour in the right position. We did, but I’m finding rules online that suggest you should go either way. This was our first attempt so I was keeping things easy. With the white pegs though there is no doubt that you don’t tell them which colours are the right ones, but just in the wrong position. Instead you just tell them how many of them there are. We also kept things easy for our first attempt by having the house rule that you couldn’t have repeated colours in your code. Obviously this makes things a little easier. I actually loved playing deluxe Master Mind once we’d all understood (and agreed) what we had to do. I’ve quite a logical brain and enjoy logic puzzles so to me it all made perfect sense as to how to interpret the code maker’s marking of the code breaking attempts. I can see how this might not be for everyone though. I found the board a little bit fiddly to use, and again I can see how that might have put some players off. Especially if they had big fingers. We sat and figured it all out with my mum who remembers having the original Master Mind back in the 1970s, but admits that she doesn’t think her and my Dad ever actually played it as it was far too complicated. I certainly recall it being in the games cupboard as a child and me and my sister spending ages just arranging coloured pegs on the board for fun when we decided we wanted a change from Lego. You can still buy new versions of the original Master Mind from toy shops and online. 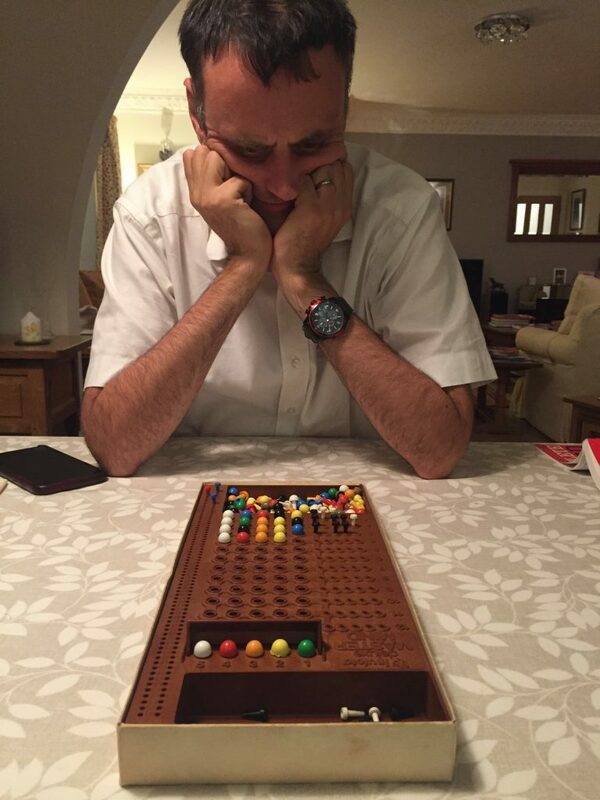 Some versions use the name Master Mind (or sometimes MasterMind) whilst others have very similar names for what is effectively the same game. What is obvious though is the absence of Invicta’s strong iconic brand. If you head over to eBay there are plenty of old versions of the game to be found. Either the original Master Mind, the deluxe or super versions or various other versions. We were lucky enough to recently pick up Number Master Mind so watch out for a review of that soon here on Penny Plays.